If you’ve been playing games long enough, you probably have at least one friend who will, every now and then, tell you about some old video game – usually a PC game – that is the Best Thing Ever, and will act very shocked and surprised that you don’t know about it, and will usually rave about how sophisticated it is, because they made it before games were “casualized”. Then you’ll go home, download a ZIP file of this obscure piece of abandonware, found through the game’s Facebook fan page consisting of your friend and a few high-school friends of his, and boot it up excitedly only to find out that it’s a clunky, ugly mess that, good as it might be, is in no way worth anyone’s time in 2017, when video games actually want you to play them. Kings under the hill – and no, that’s not a typo, that’s the official capitlization for some reason – is a game in that style, except made this year. While far from a lazy or cynical product, it does nothing to truly engage players, instead throwing a lot of concepts and numbers at you and then sneering at you for not figuring it out yourself. Whatever fun could be had with this game is hidden under a thick layer of poorly-explained concepts, other concepts that are never explained at all, a clunky interface and poor game balance. 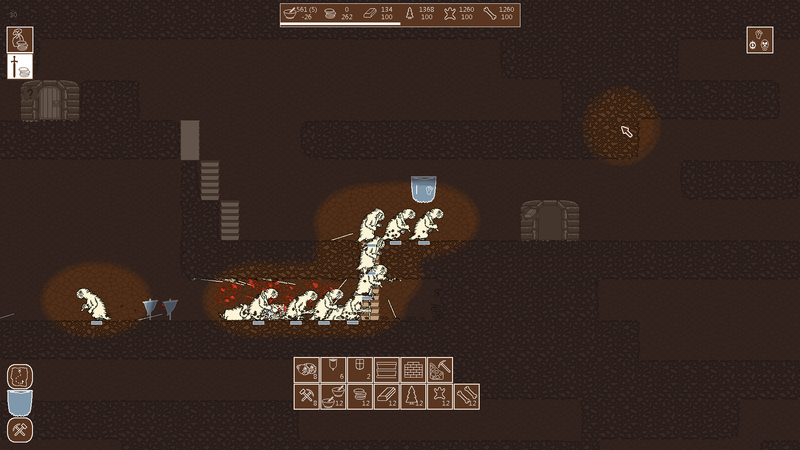 Kings under the hill is a real-time side-scrolling strategy game where you play a rat king who must build up an army of rats and kill the computer-controlled rat king. It’s a simple and interesting concept, and to give the game some credit, for all its simplicity, the art style is cute, and everything looks quite nice. If nothing else, it’s always great to see an indie game on Steam that didn’t get its assests from the Unity store. However, the novelty of commanding violent, sentient rats fades pretty much as soon as the game starts. The game offers no gameplay options other than Skirmish, which throws you into a procedurally-generated map with your rat king and a few builders. There’s no tutorial, and the only thing the game has in the way of any sort of guidance is a help menu, which you are meekly told in the title screen to activate using F1. The help menu does cover some basics, like the keyboard shortcuts that allow you to build buildings, and the difference between player-controlled attack units and stationary defense units, but it doesn’t explain other things, like how to get more resources, or how to change your attackers’ equipment, or why you are unable to build up your base past some arbitrary points. Then it all crashes down. And you break your crown. And you point your finger, but there’s no one around. Just one more thing… well, you get the point. It doesn’t help that the game is extremely poorly balanced. Even when I tried Zerg-rushing into enemy territory the moment I managed to build attackers, the AI player already had soldiers equipped with overpowering weaponry, including long-range weapons. If there’s any way to withstand an enemy attack this way, the game sure did not bother cluing me into it. And that’s a shame. Kings under the hill doesn’t look like a throwaway game. It looks like a decent first crack at game development, and I would love to tell you to throw a buck at it just to give it a shot. But there’s no point, not as long as the game obstinately refuses to do anything to make itself even slightly accessible. Difficulty and challenge are welcome, but throwing players into a situation where they are never given the tools to win isn’t fun. It’s frustrating. This isn’t the 90s anymore. I don’t have to be thankful just ’cause I’m playing a video game, and I don’t care what Mei Ling has to say about that. If you’re a huge fan of real-time strategy, rats, and old PC games, and you have a lot of time to figure out all the little details of a game while dying time after time to a wave of ridiculously overpowered enemies, you might get a kick out of Kings under the hill. It’s not expensive, either. But even with that in mind, I’d suggest spending your time on a game that has a bit more respect for it. At the very least, if a game is going to hate you, make sure it does it well.